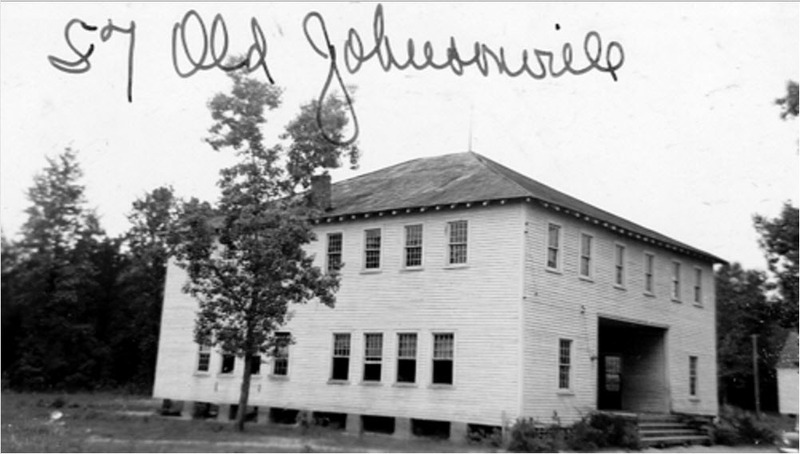 The Old Johnsonville School was established in 1903 and was built on two acres of land that was sold to C. J. Collins, W. C. Hemingway and L.L. Ard who were the trustees of Special School District # 23, and their successors in office on August 7, 1906 for the purpose of building a school, for the amount of $50. 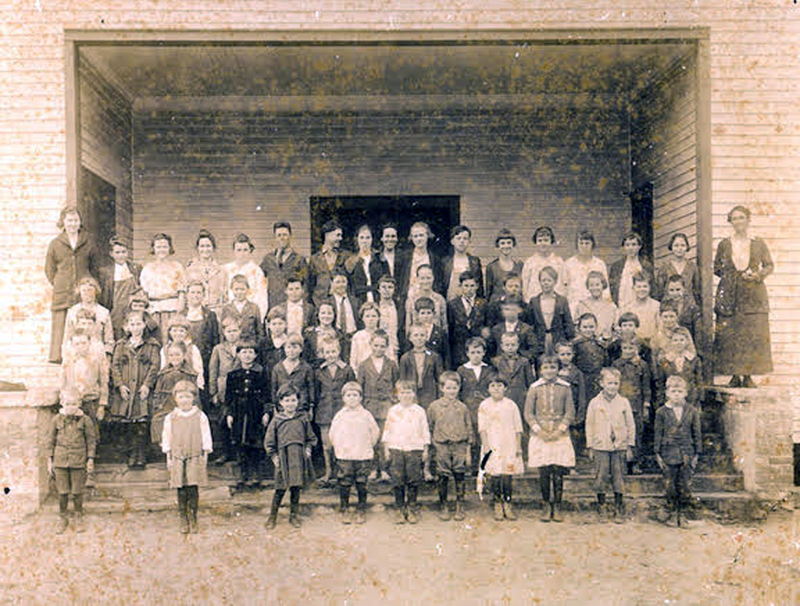 When the school opened, there were 4 teachers and the first class of 7 graduated from the tenth grade in 1907. Buddy Newell reported that his father graduated from the school in 1916 and he still has his diploma. The school closed in 1942, a year before Buddy started the first grade. The Old Johnsonville Methodist Church used the school for Sunday school even after the school closed in 1942. The church held functions to earn money for the school and it was stated in the teachers contracts that they must teach Sunday School if asked and the Principals served as lay ministers if necessary. 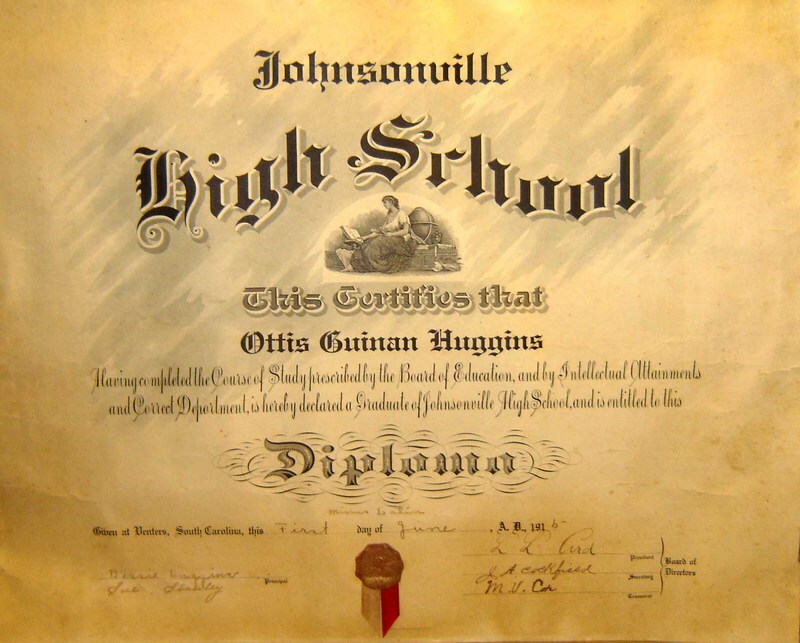 Ottis Guinan Huggins graduated in 1915 and his diploma is still intact. The year he graduated, Eunice Huggins, his sister, was the principal and signed his diploma. Bessie Huggins and Eunice Huggins were teachers at the school and they both served as principal. Clifford (Danny) McDaniel, who was a student at Old Johnsonville recalls that just inside the front door to the right there was a room that the teachers served peanut butter and crackers for the students if they wanted some and that there were wood burning stoves in each room. He also recalls that there were two outhouses behind the school, one for the boys and one for the girls. The second floor was the auditorium where the students attended chapel every morning before classes. After a speech by the principal, the students said the Pledge of Allegiance, sang songs, read scripture and said the Lord's Prayer. People in the community provided the trees for the lumber to build the school. Others donated their labor, money and other supplies. Everyone pitched in to help. In 2011, Mr. Derick Wall, age 93, said that he remembers when the Old Johnsonville School was started. He said “It was started over a store at Ard's Crossroads and classes were held there for about a year until the school was built.” When Mr. Derrick began attending school at the Old Johnsonville School, there were only grades 1 through 7 and it was known as a graded school. Mr. Wall attended through grade 7, then had to go to Johnsonville for the 8th grade. Mr. Wall recalls that Mary Etta Livingston hit him over the head with a ruler. Mr. Jack Cockfield recalls having to walk to school and said that he would put his milk in the flowing artesain well water to keep it cool and that sometimes the county would send fruit for the students when it was in season. “Miss” Nina recalls walking to school with a group in 1936. They had to carry their lunch, her teacher was Mrs. Lett. She only remembers that the school had tall windows and that she was in a room on the left. Prof. S. H. Brown, Rosa Belle Eaddy Woodberry Dickson, H. M. Floyd, Rembert James, A. D. Jones, C. B. Hanes, Bessie Huggins, Eunice Huggins, Levoy Newell, and Sue Stanley. 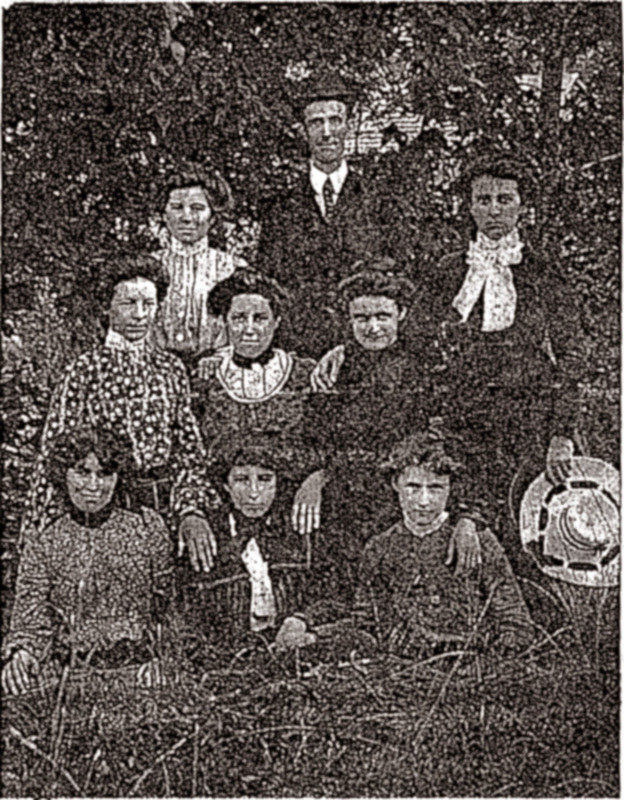 S. H. Brown, Ethel Chandler, Alma Chapman, O. M. Chapman, Lillian Cockfield, Mildred Cockfield, Eulalia Cox, Rosa Belle Eaddy Woodberry Dickson, Helen Louise Dietz, Ruth Dorrill, Mrs. Dowell, Beth Eaddy, Miss Elam, Annie Epps, Mrs. H. M. Floyd, Mrs. G. W. Flowers-Leland, Genette Grayson, C. B. Haynes, Grace Hemphill, Miss Hudson, Bessie Huggins, Clarice Huggins, Cora Huggins, Eunice Huggins, Kenneth Huggins, Claudia Johnson, Mr. and Mrs. A. D. Jones, Virginia Lett, Mary Etta Livingston, Lillian Edith Lofton, Dwight McAllister, Miriam McFadden, R. S. Major, Christine Newell, Nannie Ervin Poston Owens, Myrtle Ethel Poston, Ellen Reese, Elise Rollins, Annie Rooke, Ola Spring, Sue Stanley, Pauline Stone, Eva Venters, Ida Venters, and Pauline Wilson. L. L. Ard, A. A. Cockfield, Mellon Vance Cox, Dr. W. C. Hemingway, S. H. Poston, and C. Jeff Rollins. Bennie, Woodberry, John, Wyand, Claude. Students that attended the school, Derrick Wall, Gertrude Wall, Danny McDaniel, Nina Cox, Dale Eadon, Clarence Newell & Mr. Jack Cockfield. Buddy Newell and David Brown whose fathers attended. The County Record, Honor Roll lists, reports of school functions and activities and reports of teachers meetings and testing for teachers and original deed. Note: This list only reflects a fraction of the student body. One article that I read recorded about 25 students on the honor roll and reported a student body of 168.